"'Tis ye, 'tis your estranged faces that miss the many-splendored thing." In the years following World War II, romance films depicting the hurdles and frustrations faced by lovers from different cultures became a screen staple. Love is a Many-Splendored Thing is one of the finest entries in the genre bolstered by great performances (William Holden, Jennifer Jones), good scripting (courtesy of John Patrick's adaptation of the best selling book) and one of Alfred Newman's most memorable scores. Han Suyin (Jennifer Jones) is an overworked, compassionate Hong Kong doctor of mixed race; English on her mom's side with Chinese lineage courtesy of her father. Although respected professionally, Suyin faces the dual hurdles of condescending attitudes from outsiders and indifference from those of her own race that feel she's striving too hard to blend into the bigger picture. At a dinner party, journalist Mark Elliott (William Holden) takes notice of Suyin in conversation and is taken by her grace and beauty. Making the most of an opportunity, courtesy of her misplaced fan and gloves, he makes his move and sets what could be a record for the shortest span of time between hello and an invitation to dinner. Politely declining for the moment, Suyin is charmed by Mark's bold, confident nature to request he call upon her at a more convenient time. Afterwards, close friend and fellow colleague John Keith (Murray Matheson) informs Suyin that the newspaperman is married. Unfazed, the disclosure doesn't throw her at all because like a typical male, she knows he'll never call. Seconds after she returns to her private quarters, Mark makes good on his promise. Days later, the twosome enjoy a pleasant evening out at Hong Kong's Night of the Moon festival, highlighted by Suyin's revelation of her husband's tragic death and Elliott's admission of his marital status. Understandably hesitant to pursue things further, Suyin doesn't feel a follow up date would be appropriate, but Mark remains steadfast. After a quick assignment in Singapore, the twosome meet again at Suyin's workplace. Prior to departing for an afternoon of soaking up the sun, Elliott reveals that although married, his wife and he have been separated for 6 years. Thanks to his honesty, romance blooms as the Eurasian doctor eschews tradition of a grieving widower's ambivalences by opening up her heart and learning to love again. It's not long before marriage talk pops up, but many obstacles remain: Elliott's long sought divorce, approval from Suyin's tradition-minded family, impending war between North and South Korea, and inevitable conflict brought on by romantic insecurities and racial sensitivy. With the real life Han Suyin's personal experiences serving as source material, Love is a Many-Splendored Thing has more of an edge than most cinematic romances of the 1950s. Although the story may seem dated, given its age the issues of interracial coupling still rear their ugly heads in close-minded circles, making the basic premise just as relevant in today's society as a half-century past. John Patrick's well-written screenplay does a great job of balancing these serious elements while not forsaking the crowd-pleasing aspects of your typical romantic drama. Bolstered by the great chemistry between Holden and Jones, one can't help be drawn to their plight, filled with many hurdles to jump and rendered with such poignancy. Speaking of the classic screen beauty, many took issue at the casting of a non-ethnic as the female lead, but Jones invested herself so fully into her Oscar®-nominated role that it makes one forget her true nationality. In the classic scene as Suyin arrives for an afternoon meeting by a favorite tree with her heart pounding and her face exemplified with excitement, only the most aloof won't be moved. Holden is equally affecting as the confident yet compassionate journalist unwilling to take no for an answer in matters of the heart. More well known for his tough guy roles in films like Stalag 17 and The Wild Bunch, the Illinois native could also be a very convincing romantic lead and his work in Splendored is prime proof. If there's any fault to be found, my only misgivings stem from the lack of time devoted to the wartime storyline that pops up late in the film, and the bordering-on-overkill utilization of the film's main musical theme. Image Transfer Review: Luminous as Jennifer Jones' herself, a terrific job with Leon Shamroy's lovely cinematography and Charles LeMaire's Oscar®-winning costumes coming off beautifully in the finished product. Although some slight edge enhancement and color shifting during scene transitions are noticeable, they are minor detriments in an otherwise consistent and well done presentation. Audio Transfer Review: At the time of the making of this film, Hollywood was using every trick in the book to lure audiences away from the competition of television, from widescreen presentations to stereophonic sound. Like a majority of multi-channeled soundtracks dating from this era, Splendored does have it limitations mainly due to the gimmicky presentation of dialogue; when actors move from one corner of the screen to the other, their lines follow and are isolated on the corresponding speaker, a method that does take some getting used to. That aside, there's more to appreciate than criticize, especially Alfred Newman's award-winning score, which is used in a nicely spread 4.0 mix to pleasing effect, with subtle yet effective ambient sounds, divided up between the fronts and rears. Extras Review: In the vein of previously released titles in their Studio Classics line, Fox supplements an already impressive feature with sublime extras. Historian Sylvia Stoddard, cinematographer Michael Lonzo and Daily Variety writer/USC music professor John Burlingame (who's also working on a much-anticipated biography of Alfred Newman and family) join forces for one of the best audio commentaries for a vintage film that I have had the pleasure to listen to. Although recorded separately, their comments were carefully mapped out in advance so that the track remains screen-specific and covers a wide range of topics. Stoddard provides fascinating insights on Asian culture and additional background on the film's real-life couple. Lonzo is a walking encyclopedia of tech info, pointing out what was and wasn't shot on location (which helps one appreciate the film's excellent editing) as well as pointing out the substantial contributions of uncredited second unit director Charles Clark, the man responsible for the many of the movie's memorable location sequences. Daily Variety's Burlingame puts his musical expertise to wonderful use taking us through all of composer Newman's soundtrack cues and how they helped inspire the award-winning musician's next project: The King and I. In addition, many interesting nuggets about Fox's resident melodic genius materialize, including the surprising disclosure of his dislike of having to come up with original compositions! On a par with the commentary is the terrific 41-minute profile of actor William Holden. Originally broadcast on A&E's Biography, An Untamed Spirit is a fast-paced overview filled with classic clips from his best films, interviews with fellow actors (Ernest Borgnine and Cliff Roberts among them) and many touching stories, including how screen legend Barbara Stanwyck went to bat for him after Columbia Pictures executives were on the verge of firing him from Golden Boy, an act of generosity Holden never forgot (touchingly thanking his co-star in an unforgettable and unscripted moment while the two served as presenters at the 1978 Academy Awards). In addition to the film's original trailer, six additional coming attractions spotlighting other titles in Fox's Studio Classics line are contained. Wrapping up the extras are two brief but star-filled clips from the studio's newsreel vaults featuring vintage glimpses of screen icons including Natalie Wood (barely holding back tears as she accepts a posthumous honor for James Dean), Grace Kelly, Shirley Jones and Splendored co-stars Holden and Jones. 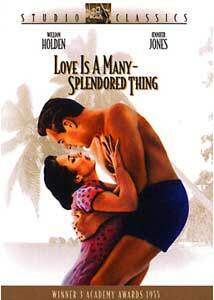 One of the greatest romance movies of all time given first class DVD treatment, Love is a Many-Splendored Thing is a moving love story given emotional weight by its fact-based origins and is a worthy addition to Fox's ongoing Studio Classics line.